If you are remodeling your home, you understand how messy things can be. Replacing, removing, and disposing of debris can take enough time and effort in itself before the actual installation of your fixtures even begin. With Speedy Floor Removal in Tampa, Florida, you can eliminate the hassle of removing your flooring with our dustless floor removal services. For many years, we have been removing hardwood flooring, tile, carpet, and more in homes and businesses throughout the Tampa Bay area. Ready to ease your floor replacement project? Call the experts at Speedy Floor Removal today for fast and reliable floor removal service. When a general contractor breaks up your old flooring, dust is created and then scattered throughout your home. If you or a family member has asthma or allergies, this excessive amount of dust can really impair breathing. It can also increase the number of times you have to clean for the next few weeks and even months! That is where Speedy Floor Removal comes in. With our dustless floor removal service in the Tampa area, you can guarantee that your home is dust free. So, how do we do it? At Speedy Floor Removal, we have special machinery that is brought into your home that collects dust rather than letting it linger in the air. Our special HEPA (High Efficiency Particulate Air Certified Cleaners) remove any particles in the air that are too small for the naked eye to leave your home or office dustless and clean. Speedy Dust Collection Systems collect almost one pound of dust per square foot, and our HEPA Certified Air Cleaners capture dust unseen to the eye, all for the purpose of helping protect what matters most in your home. Want to learn more about our floor removal process? Call the experts at Speedy Floor Removal and ask about how our floor removal services in Tampa works! 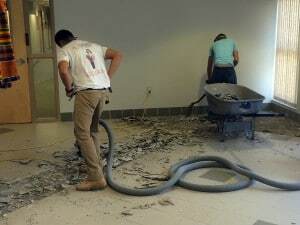 Why Schedule Service with Speedy Floor Removal? No Damage. Our highly skilled professionals are experts at removing carpet, tile, hardwood flooring, and more throughout the Tampa Bay. At Speedy Floor Removal, we offer three unique packages that are perfect for any need. Our most popular package is the Premium Package—this package guarantees no dust and no cleaning. Click here to view our three floor removal packages. If you are unsure which package is right for you, call one of our experts to discuss which best fits your needs. Clearwater, Dunedin, Dade City, Zephyrhills, San Antonio, Brooksville, Tarpon Springs, Largo, and more!